While they may not have won 73 regular season games like last year and they don’t have Michael Jordan, Magic Johnson or Larry Bird on their team, the 2016-17 Golden State Warriors have been the most dominant team in NBA history and tonight they can complete the first perfect postseason in NBA history by sweeping the defending champion Cleveland Cavaliers and winning their second title in three years. They have not only won all 15 of their playoff games to this point, they have done so by outscoring their opponents by an average of 16.1 points per game. To put that in context, no NBA team has had that high of an average margin of victory for a season in NBA history, not to mention a postseason when the intensity is ratcheted up 10 notches. The Warriors have been the best offensive and defensive team in the NBA during the regular and postseason. They have by any measure four of the 15 best players in the NBA at the moment, including two of the last two MVP winners in Steph Curry and Kevin Durant. Out of the teams listed on this list, the obvious choices to compete with this Warriors team as a whole for greatest team in NBA history would definitely be the 1995-96 Chicago Bulls, the 1986-87 Los Angeles Lakers and the 1982-83 Philadelphia 76ers. The 2000-01 Los Angeles Lakers had the most dominant postseason of any team in league history until this season as they went undefeated in the western conference and outscored their opponents by more than 10 points per game while winning their second straight NBA title. Yet none of those teams had the level of talent, skill and ball movement of this 2016-17 Warriors team. The closest comparison would be the 1986-87 Lakers as Magic was at his absolute peak, James Worthy was entering his prime, but Kareem was on the downside of his career and the Lakers didn’t have the number of shooters and play makers that the 2016-17 Warriors do. The fact that a 73 win team and recent champion added more than likely the 2nd best player in the NBA today, a player that has fully committed and fit seamlessly in their system has taken an all-time great team to the most impressive accumulation of talent and the most unstoppable force the game of basketball has ever seen. The Cleveland Cavaliers were 12-1 coming into this NBA Finals, the defending champions with the greatest player in the NBA and one of the five greatest of all time (at least, in my opinion) yet they still are barely able to even compete with this Warriors team. 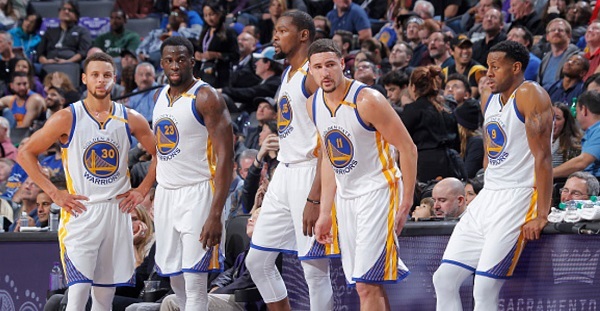 All of the prideful former players (Magic, Pippen, Dr. J, Rasheed Wallace) can talk about how their championship team would have beaten this Warriors team in a hypothetical series, but the reality is that this Warriors team is an evolved and improved form of basketball that we have never seen before. With the way the game is played and officiated today none of those other teams would have any realistic chance of beating this Warriors team four times in seven tries. The Warriors haven’t lost a game with all four of their top players since February 4th, that is more than four months without even suffering a loss. No matter where you stand or where your alliances lie in this year’s NBA Finals, take a step back and appreciate the greatness that is unfolding, because we may never see the likes of it again on an NBA court. This Warriors team can go on to win the next three to five NBA championships, but they will likely never replicate the sort of greatness they have this postseason.